There are so many days where I learn so much from staying home with my children. There are so many new concepts or cool analogies about parenthood that I would love to share with the rest of the world, but sadly enough, I can never find the time to pen my heart! I find myself looking forward to writing a new blog to encourage other woman, especially mothers, and 2 weeks later I still have not be able to find the time to sit down and write. Even as I write this post tonight, my littlest, Atirah, is teething and has had a fever for the last 36 hours. She refuses to sleep and wants me to hold her 24/7. Now that would be completely do-able if she were my only child but she isn’t, she is my third! So it has been hard juggling the kids, homschooling, feeding everyone, playing, keeping the house clean, etc. Today I didn’t have a shower and get dressed until almost 4pm! It was a long day but as I sit here and ponder the events of today, I am so thankful that I was able to be here in my home with all my kids, especially the little one who needed me most. I find it sobering to think that one day they won’t need me like they do now. I am so used to hearing “mommy!, mommy!, mommy!” that the thought of not hearing that beautiful echo casts a sad shadow over my soul. I love to be needed and wanted by them. I was made for this! You were made for this! Let us not forget the importance of this time. Seasons will come and go, opportunities to share with others will always be there but our babies will not always be here. Remember that we are important, what I do today shapes the generations to come. I was doing a bit of generational math and realized that my influence in my children’s lives (developing their morals, worldview, character, faith, etc) will, in the next 60 years will directly impact 130 individuals. And that is only my grandchildren and their children and spouses, not to mention that hundred of thousands of people that they will interact with individually. There is no way that I could personally influence that many peoples lives in my lifetime alone . Investing in our kids bring exponential growth and blessing! May you be blessed as you continue to serve and grow on this journey. You are a woman of faith, let your light shine! 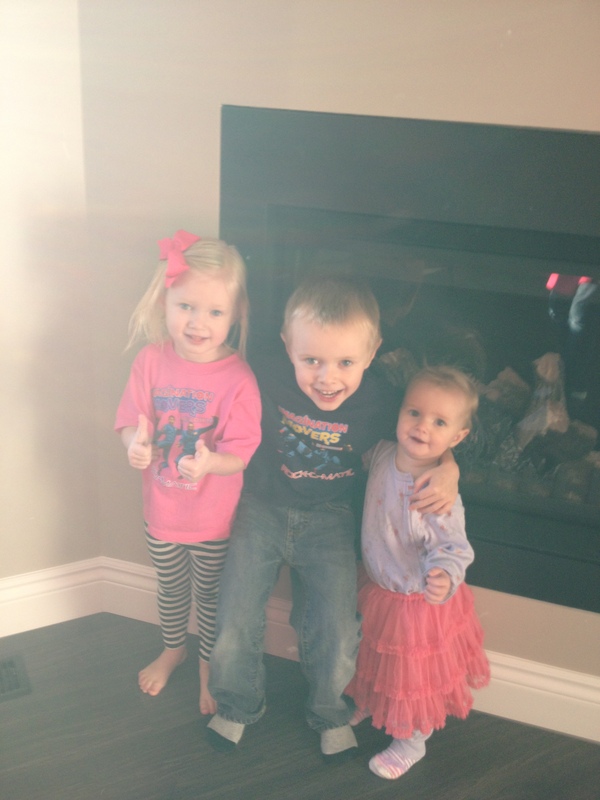 Today I have been crying out to God to give me grace in raising my children. Most days offering up grace prayers is the best thing I can do for the kids and myself. I attending a wonderful weeking of inner healing and teaching about the power of our words and actions with our children. I learned that as a mother I am God agent sent to give birth to and nurture my children. I have the ability to bless or curse them with every interaction we have, verbal or non-verbal. I want so much to bless my little ones to empower them to prosper emotionally, spiritually, and physically. I have decided that praying specifically for each of them throughout the day is very effective! Lord, help me to remember that washing Mercy’s sheets AGAIN in the middle of the night because she peed the bed AGAIN is not that big of a deal. Help me to remember that I am just tired that is why it seems so tedious. God thank you that I can serve my daughter in this way, I’m glad she will learn that she can always trust you to provide for her basic needs. Help me to give her an extra dose of love today as I know she feels bad for having an accident. Show me how to bless her soul so she knows that I love her for who she is NOT what she does! Lord, give me grace to deal with Judah who wants to complain about everything I ask him to do. Help me to remember that he is testing my character, and ultimately Lord, you are testing my character. He is testing to see if I am consistent, truthful, loyal to my words, he is trying to determine whether he can trust my leadership and he is building a foundation for boundaries in his own life. God help me to remain strong, help me not to give into anger or the desires of my flesh. Remind me to bless Judah, to offer him choices rather than punishment. I want to our relationship to be my first priority. I know there is something more important than being right Lord, its being free! God I need your GRACE with Atirah today. Lord I bless her eager, busy, adventurous spirit, that is fearless. Lord I ask for extra patience, kindness, gentless, actually I need ALL the fruits of the Spirit with her. Lord I still an unclear as to your destiny for her life as she is just starting to develop her personality, but I know one thing…she has a determination and strength that will carry her through every obstacle she might face. Thank you God. Thank you for her boldness, her humour, and her life. God give me the supernatural empowerment to care for her, train her and guide her through this life. Lord when I get frustrated and tired, bring peace and rest to my soul. Remind me to cry out for you to help me and not to try to deal with her on my own, she is a gift, thank you for her! Lord empower me to mother, to nurture and to care. Let me give freely of myself as you gave freely of yourself for me. Let my children always know deep inside that NO one loves them like I do. I pray that they will see this in everything I do and say for them. May you experience the freedom that comes from complete surrender and obedience in the small things!! May God grant you an extra dose of grace today!!!! 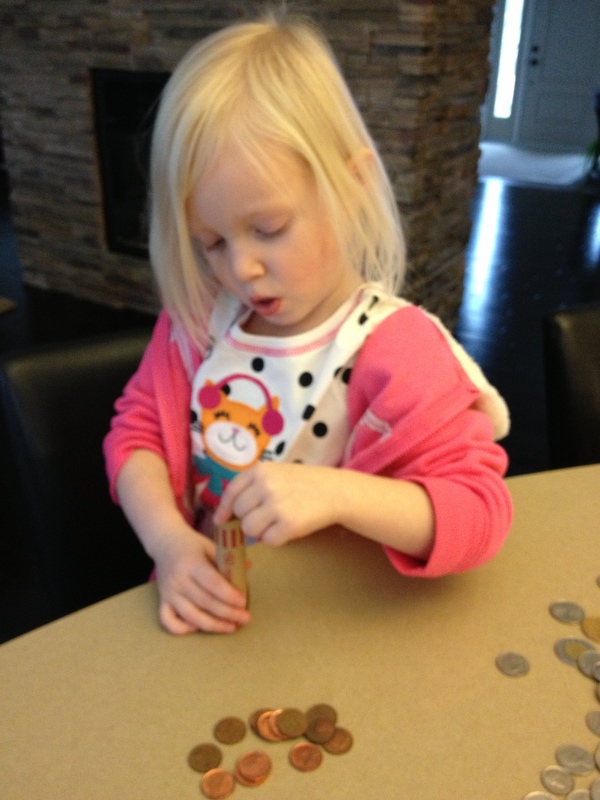 We used fishy crackers to demonstrated how 10% actually isn’t really that much and how God could have asked us for 90%:) We counted all their money in their piggy banks and they decided that it was time to give God back the tithe. 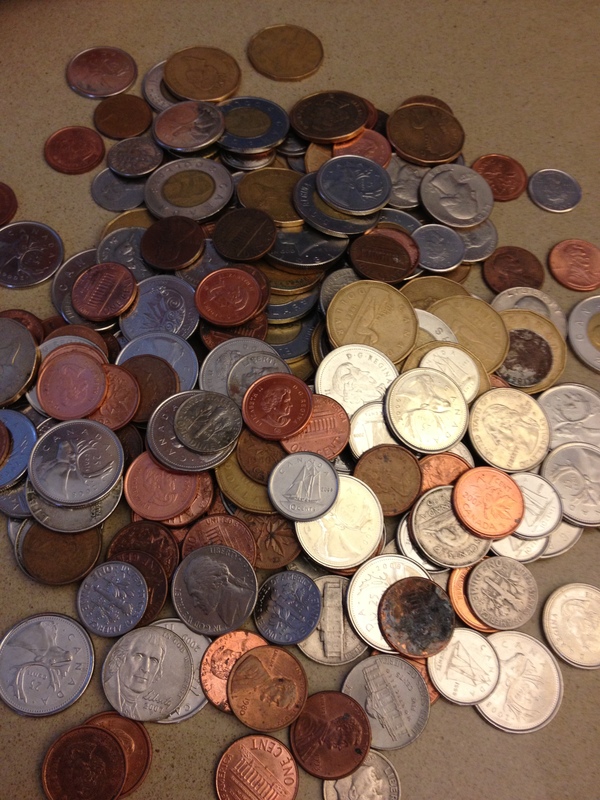 It was surprising to hear Judah say, “a tenth isn’t actually that much mommy, I still get to keep all of this?”! 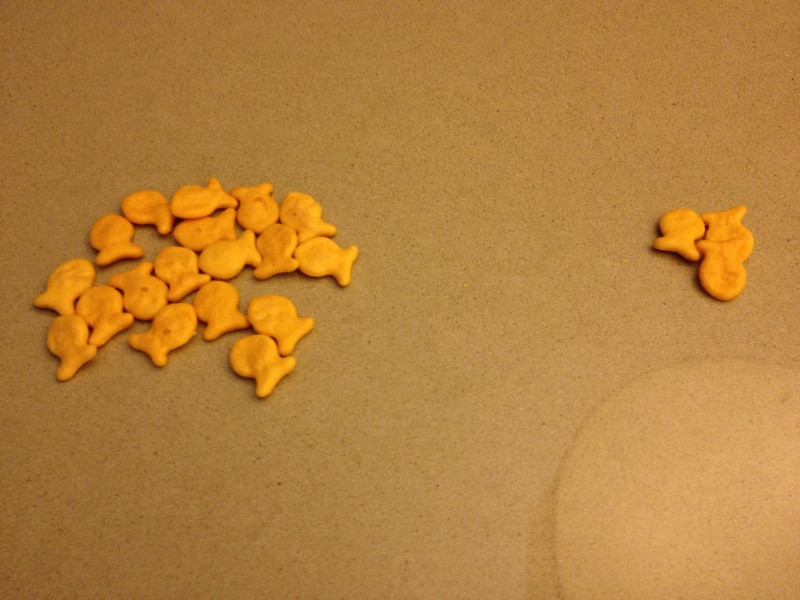 Fishy crackers were a great teaching tool! It was a such a joy to teach them this principle, something that they will impact them for the rest of their lives and that will bring blessing and opportunity to give even more. I look forward to all of the other money principles that we will talk about; “the love of money being the root of all evil”, “being good stewards of our money:,” the joy of giving”, “God’s plan for us as believers to mobilize the gospel”…there is so much that I can’t wait to impart into them! 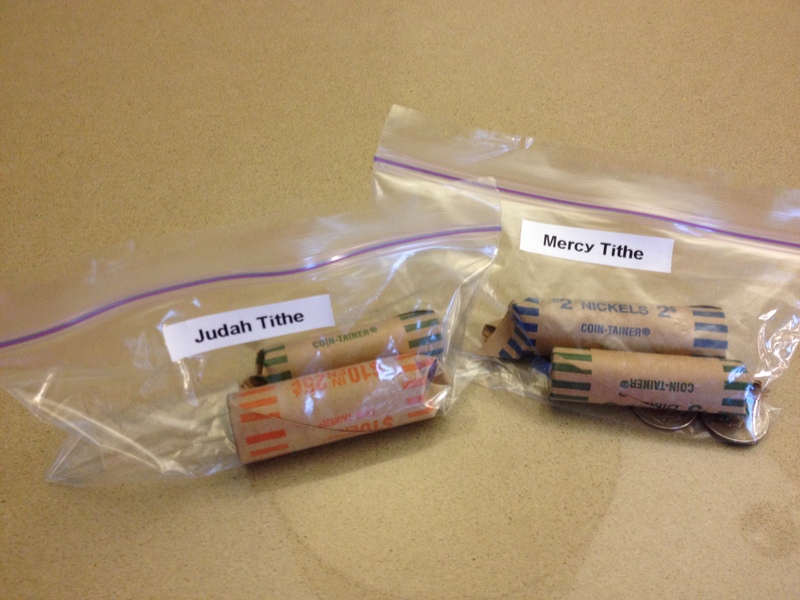 I cannot wait to see our children, Judah and Mercy, bringing their tithe to our church and giving it back to the Lord! What are some other principles that you think are important to teach? One thing I have learned about family and children is that we need to be intentional about what we do! Be sure to mark it down when God gives you ideas of what to teach them. I believe He tells us specific things at certain times because these are windows of opportunity. Take advantage of these windows. May you be blessed today, May you have the grace you need to be all that he has called you to be!!! As a mother, do you ever find yourself getting so caught up in ALL the activity in your home that you are not able to just sit back and enjoy the days with your little ones? Sometimes I find myself doing so many little things in a day that I forget to take time to really enjoy my kids. It seems strange seeing as I am home all day but it happens!! As mothers we need to be intentional about making time to spend with our kids. There are days when I get to the end and realize I haven’t really spent much quality time with them. It’s easy to be present in their lives but to set aside undivided attention is essential to make those strong relational connections! 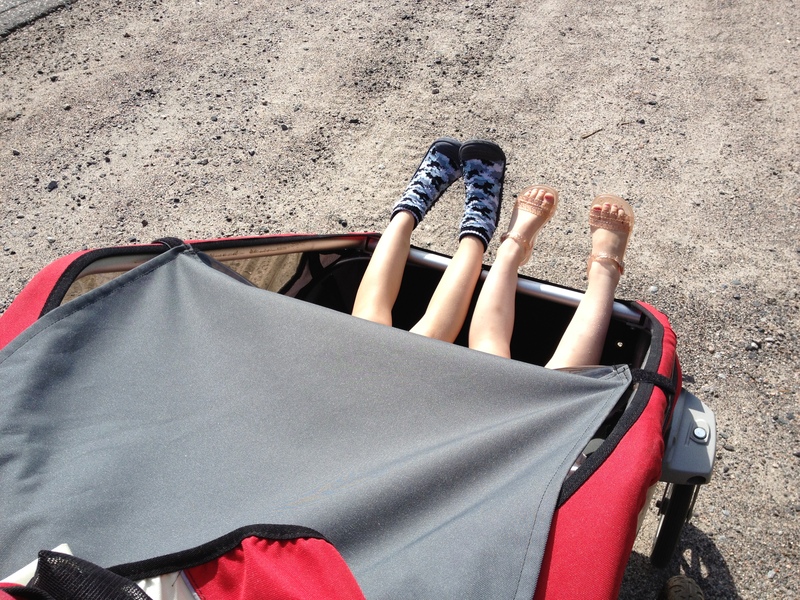 Life with little ones is definitely a unique, fast and unexpected ride; one that I really want to enjoy!! 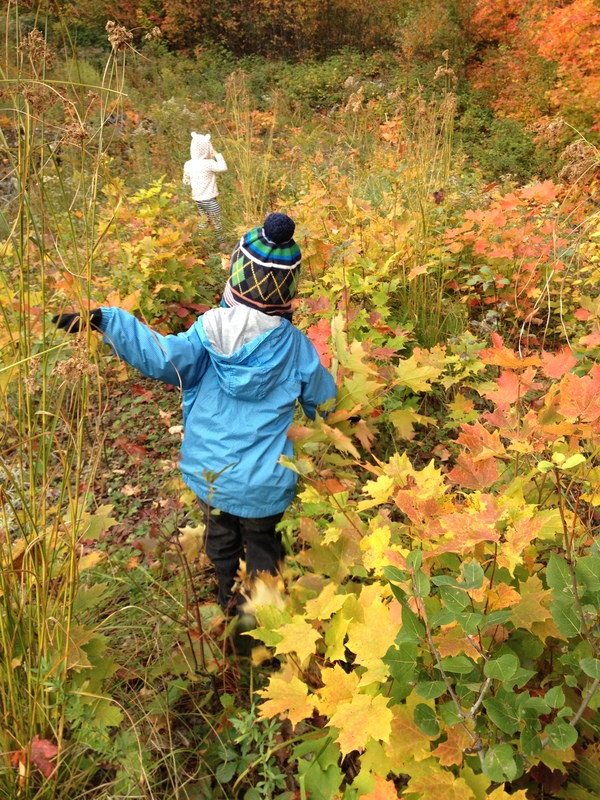 I have found it helpful to set aside time each day to focus only on the kids. Now ideally, it would be amazing to set aside all my time for them but that is just not realistic. I need time to run our household and they need to learn that Mommy has things she needs to get done in a day so that our family can be provided for. I have chosen specific times each day to devote to only them. When we wake up from 8am until 11am my attention is undivided. This is when we do homeschool, play games, go outside, read books together, play dress-up, go on a little field trip, etc. It is a time when I am not answering my phone, not doing laundry or dishes, not sweeping or doing anything other than making them my first priority. From 11 until about 3, we eat lunch and then everyone has their nap or quiet time and THIS is the time when I spend cleaning up, doing dinner prep, sweeping the floors, journaling, reading doing whatever needs to get done. Once everyone is up again from about 3-4pm we spend more quality time and then they take time from 4 until daddy gets home to play together or go outside. This doesn’t happen every single day but when we are home I try to stick to this schedule. I have found that it makes such a difference when I take that uninterrupted time for them, we get more accomplished and we are are able to sit back, relax and enjoy each other. I find that time already flies and my children are growing up so fast, the last thing I want is to look back and regret spending quality time with them. Some of my favorite time are; listening to their stories, watching their puppet plays, playing pretend salon, battles with knights and dragons, having car races, eating all sorts of fun creations from their play kitchen, playing Mr. potato head, colouring together, and talking about God. What are some ways you could rearrange your schedule to ensure that you are maximizing your time together? May your connection with your children deepen this week. May you sit back and enjoy these simple and sweet times together and may you give thanks to the One who gave you these precious little lives!!! As a mother who is passionate about family, I am VERY passionate about cultivating the relationships between my children and their grandparents and great-grandparents. 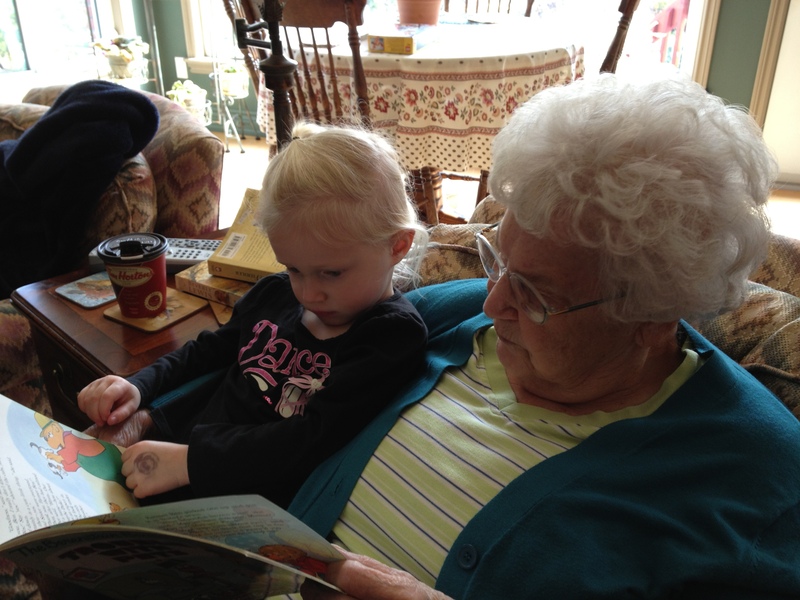 I smiled this morning as I was watching my little Mercy listen to her great-grandmother read to her. My grandmother is 85 years old and such a beautiful woman. There are 82 years between Mercy and my grandmother. She loves to read to the children and they love her so much, they call her Nana. It has been such a gift to have her with us and for my children to learn from her and allow her to pour into their lives. This unique relationship gives my children a reverance and curiosity for Nana and her life and the kids bring a joy and purpose into my grandmother’s life that I see everytime they spend time with her. I thank God for this unique relationship! May you encourage your children to build bridges between the generations to learn and glean from them. There are things that they have experienced that we never will and it is an irreplaceable treasure for our kids to hear stories from them rather than reading them in a book! Bless you as you encourage your family today!! Enjoying the fall in our backyard! My heart is full of thanksgiving as I take a moment to reflect on all of the incredible blessings in my life. I am SO thankful for…cool autumn walks, changing fall colours, baby kisses and snuggles, a creator who loves me, the sound of little feet that pitter pat down the hallway, a son who is beginning to look like his father, a warm home, my little girl’s blue eyes and blond hair, amazing friends, a fun backyard to explore in, warm coffee, freedom to dance, hearing little people call me “mommy” all day long, being loved, being able to love others, a wonderful family of believers, long distance friendships that I can count on, coconut muffins, being born in this generation, sharing life with my best friend, being home with my babies, not knowing what tomorrow hold but feel hope and anticipation every morning I awake. May you enjoy rich family time this weekend. May you have a wonderful thanksgiving as you remember the One to whom all “thanks” is due! !